so, i'm pretty short - a fact that may or may not have come up here previously - and have the usual short person frustrations of having to hem just about every item of clothing to fit. i always hate to have to hem jeans especially as you always lose the "worn in" hem that they came with and end up with a glaringly obvious brand spanking new version. boo. 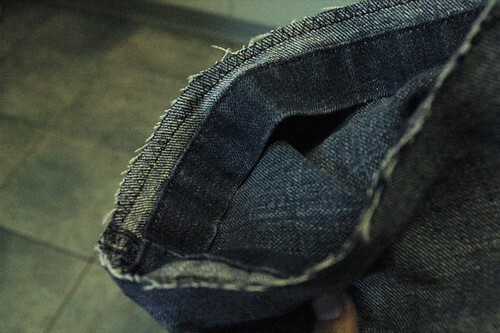 then a few years ago a tailor told me he could shorten my jeans WITH THE ORIGINAL HEM. and he did. and they were great. and i never could really figure out how he did it, or was a bit too scared to figure it out as my sewings skills were a bit more basic back then. anyway, i ordered a few pairs of my beloved james jeans from ebay over the past few months (i love them. 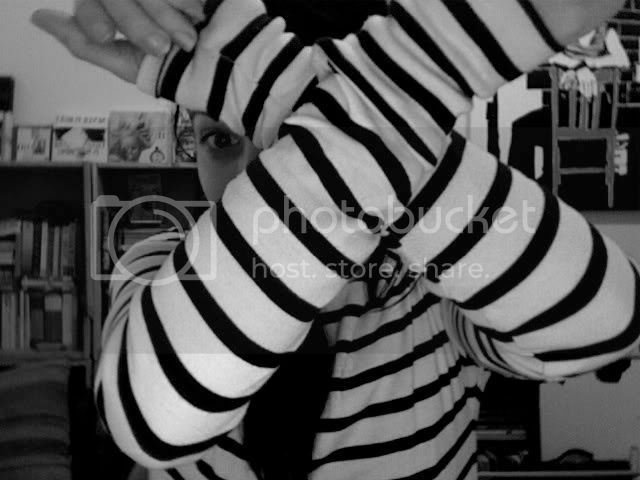 they always fit to size, no matter what style) and, of course, they're both too long. one pair, however, has previously been hemmed in this "original hem" style and when i took a good look at them i realized it wouldn't be hard to do at all. i hemmed up both pairs over the weekend with brilliant results and took a few pics along the way to share the quick and easy technique with you all. cut off the existing hem about 1/4 inch (5 mm) above the line where it's been sewn. then try on your jeans and mark the length you want them to be. 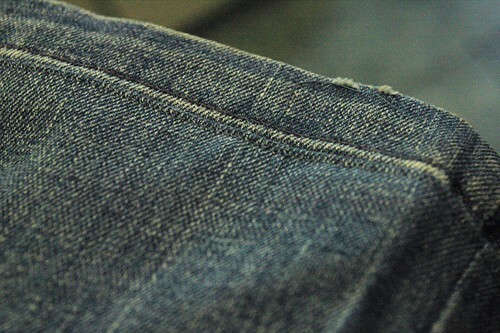 cut the jean leg in a straight line 1/4 inch (5 mm) below where you marked. 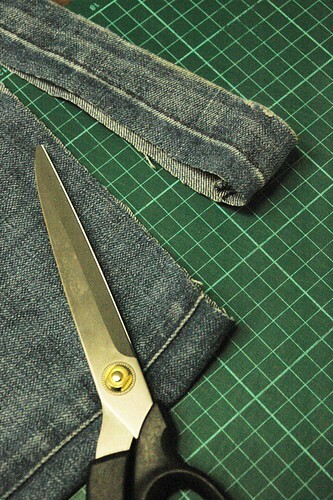 turn the jeans inside out and pin the hem you've cut off to the leg, keeping right sides facing each other. i found it was easiest to pin on either side seam and then pin along the hem, stretching as you go. now sew this together, using an overlocker or the overlocking stich on your regular sewing machine to prevent fraying. 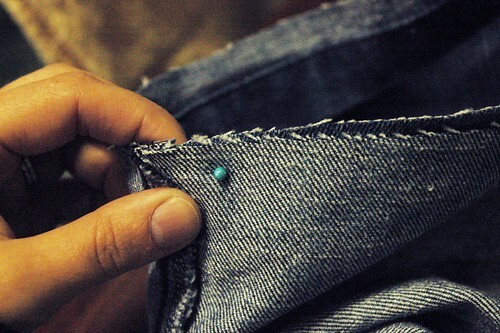 very carefully, and using a similar coloured thread to match your jean material closely, use a basic stitch to sew along the ironed edge, as close to the edge as you can confidently get. and there you have it! sorry if these instructions seem a bit confusing, if you follow them along once i really feel you'll get it quite quickly. i'm thrilled with the whole thing because i'll never have to wear daggy self-hemmed-looking jeans ever again. yay. Kevin will be glad I've waited so long to take his jeans up !! now they will at least look good. Hemming is becoming so expensive now especially when you add it to the cost of the jeans. I've had a few friends now do the big crawl for me to do theirs since they found out I do it myself. i've often wondered about how to do this as well... having heard it is possible! thanks for the little tutorial! 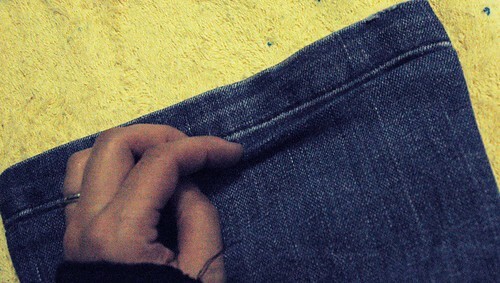 even though i'm not really considered "short" per-se, i do have short legs which usually means hemming jeans and pants. lately though i've been too lazy to bother and just end up rolling the hems up a la 1950s style. lol. that is too cool- I don't need anything hemmed, but I think I might just to try this out. Maybe my old 501's, and then I'll slide on white socks with my black penny loafers (a la Michael Jackson circa 1985) to totally rock the ankle length. Mmmm... maybe not. Heaps of credit for figuring it out and sharing it! Those look great!! You would never even know they were altered. Kudos! thanks so much for this tip! i sometime have to hem my mother-in-law's jeans and they always look crap when i'm finished. so this is very handy indeed. great idea! i usually do a normal hem and then scrub the edge with a pumice stone to wear away a bit, but this saves the time of scrubbing. nice one! Thanks so much for these great instructions! I'm short too and have always hated that new hem look on jeans. I can't wait to try this out. I saw Martha Stewart break in a pair of new jeans to get that lived in look, she used a dremel tool and sanded away the fibers on the seams..and took sandpaper and rubbed it on the thighs, lol. Your way seems alot less involved! Believe it or not, us tall girls really need this tip...THANK YOU! Tall size inseams are always way too tall and I hate the new hem look too! I just stumbled across this tutorial and it was incredibly helpful! I've previously seen the daciaray.com tutorial and, though it was nice and easy to follow, the seam always looked weird and slightly raised. Your suggestion of ironing first, then topstitching on either side got rid of that problem. So, thank you very much!! If you have a sewing machine isn't it just easier to cut the jeans off fold them over pin them and create the exact same stitch that came from the factory? Then you don't have that little seem right next to the original hem where you sewed the two pieces together. I mean after one or two washes the new hem you create will look as worn as the original one. And if the jeans are brand new it wont matter anyway. thank you very much for this tutorial!! Excellent article! It’s just what i needed to understand.